Streetball is a nice touch. Thanks to the addition of franchise mode, there's also a salary cap. 950 points, to be exact. It stays static throughout your career, but to compensate, so do salaries. You'll never see Shaq making 500 points a year. In fact, the upper limit seems to be about 240, and the points follow the aging curve. As players get older and less effective, they will sign contract extensions for less if you need to free up room. I did that with Shaq, in fact, getting him to reduce his salary from 240 points to about 130. With a hard cap like that, 110 points is the difference between a scrub and a starter. This may not be completely realistic, but it keeps the game fairly realistic in terms of strength of roster. You might be able to afford two superstars, but you'll never be able to field a full team of all-stars. It keeps talent spread out and the league competitive. The players also mature much more appreciably than did their NFL 2K1 counterparts. While it wasn't unusual for me to see a 4th year RB with minimal increase in his stats in NFL 2K1, its also not unusual to see that PG you took late in the first round blossom into a quality player after just a couple seasons. The talent appreciation cycle is such that the current Chicago Bulls won their first championship in the 2002/2003 season in my franchise. A tad accelerated, perhaps, but as was the case with NFL 2K1, in a game like this, sometimes its best to transition quickly over to the created players, rather than stick with the old folks. The reason is fairly simple � people don't play GM-style games to see how Shaq will perform in 3 seasons. They play them to see how effective they are at building championship-caliber teams. 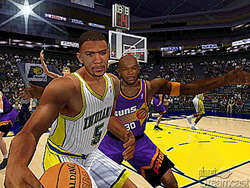 And in NBA 2K1, that can be quite a task. In 8 seasons, I made it to the Finals once, the conference finals twice, the playoffs in general 5 times, and missed them altogether three years. Granted, I quick-simmed much of that to get a feel for how players develop, but if you can't win with a bushel of talent when simming on Pro or All-Star, winning while playing the games is going to take skill, but most of all, it's going to take practice. But let's stop kidding ourselves here. Franchise mode may be a draw, but if you played NBA 2K, you're probably not here to hear about that. Thankfully, the players don't spookily stare at you from the screen during actual gameplay. That only happens in press shots. No, you're likely more interested in that Holy Grail of gaming, online play. I'm pleased to say that NBA 2K1 doesn't disappoint in this department. Some of the same problems that you see offline -� notably on the boards and on defense �- plague the AI-controlled players online. Even cranking up the tempo, fast break, and board crashing doesn't completely mitigate those concerns. The game does, however, run incredibly smoothly. I played against an opponent with a 'Poor' pingrate, and while there was a little bit of lag, that particular demon kept its face well hid. The few times he came out to play were during our Lakers/Timberwolves 5-on-5 exhibition game. Once we got on the street courts, where the game didn't have to render an arena complete with crowd, the Lag Demon vanished for good. Nothing like 2-on-2 street ball, no holds barred, to get the adrenaline flowing. What's more, the online experience has even been updated from NFL 2K1. You can now filter the rooms based on ping quality and keyboard availability. Don't wanna hassle with those punks with �Poor� or �Fair� quality? Set your filter for �Good� and �Great� only, and the poor SOBs on 14.4 might as well not even exist.. You can also now check ping rates for incoming challenges, should you choose not to use your filter, and you can even challenge people to two different types of games: exhibition (standard NBA rules) and street -- two teams, ten men, one ref, whoever's left standing at the end wins. You can even use the all-time great teams (sorted by decade as well as conference), and throwback uniforms. Street ball is a little different. No, a lot different. The only rule is, there are no rules (other than out-of-bounds, and, though I didn't see it occur, probably goaltending). There are four street courts to choose from, ensuring replay value galore, and the ability to use the all-time greats means that you can pick a 2-on-2, 3-on-3, etc matchup to find out who truly WAS the greatest player of all time. Well�mostly. The Greatest Players of the 90s aren't included, so you can't match up Magic and Michael, though you CAN match up West and Bird, Dr. J. and Magic, etc. 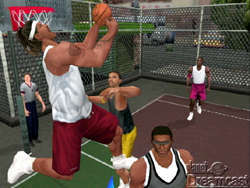 However, as entertaining as street ball is, I REALLY wish 1-on-1 play could have found its way into the game. Its one thing to set a pick-and-roll off an anemic AI. It's quite another to take it to the hole 1-on-1, where the final determinant is skill, rather than an exploitation of computer intelligence. So there you have it. Despite the flaws, NBA 2K1 is currently the best basketball game on the market. Of course, we have yet to see EA's offering for the PS2. I will, however, say this: as much as I wish Visual Concepts and Electronic Arts were going head-to-head on one (or even BOTH) systems, the cross-system competition should continue to improve both the Live series and the NBA series. Regardless of where your gaming dollars are spent, as a gamer, how can you lose? Highs: Outstanding graphics and sound, Franchise mode is a great addition, Online play is superb. Lows: Defensive AI for human teams is lacking, Jump Shots unforgiving, Franchise roster bug. Check out our sister site SportPlanet for all of your sport gaming needs!